Which is best, green tea or black tea? 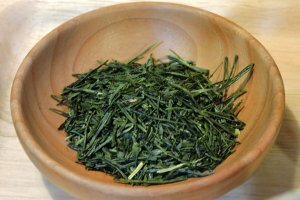 Sencha, bancha, hojicha or matcha? Since they are made from the same plant, Camellia sinensis, it's not surprising that green tea and black tea are both full of health-promoting antioxidants. It turns out that the way that the tea leaf is processed, whether steamed as in Japanese-style green tea, or roasted Chinese-style, or fermented to create black and red teas, produces different sets of antioxidants. One of your best bets if you want to live a long and healthy life protected from cancer, heart disease and brain degeneration may be to regularly enjoy many different kinds of teas. 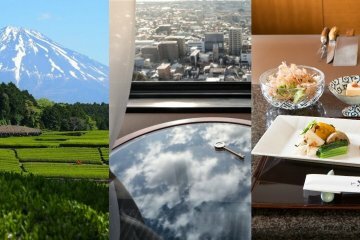 Shizuoka Prefecture produces lots of tea and is home to a rich, lively tea culture. 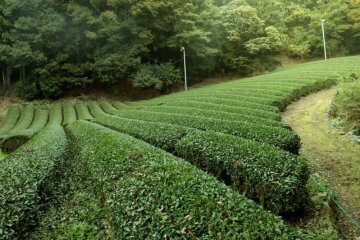 Shizuoka's tea plantations, tea factories and tea shops and cafes offer an abundance of different teas and myriad ways to enjoy them. 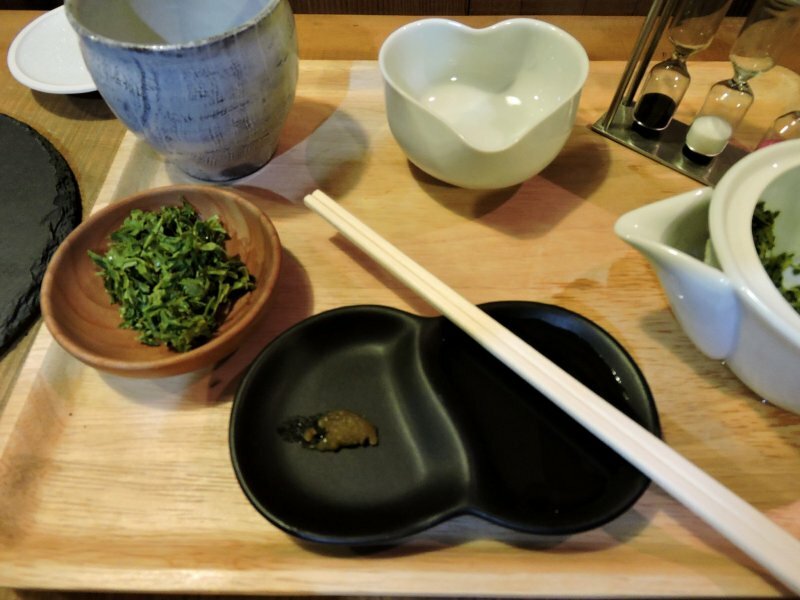 It is the perfect place to experience and learn more about tea. Maruhide Iwasaki Shoten is a tea factory located in Shizuoka city. 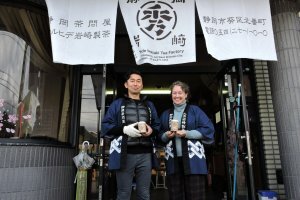 They blend and sell tea, and have won a number of prestigious awards for their excellent tea, as well as for innovative product design. 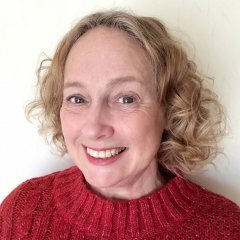 I went there for a tea blending workshop experience. 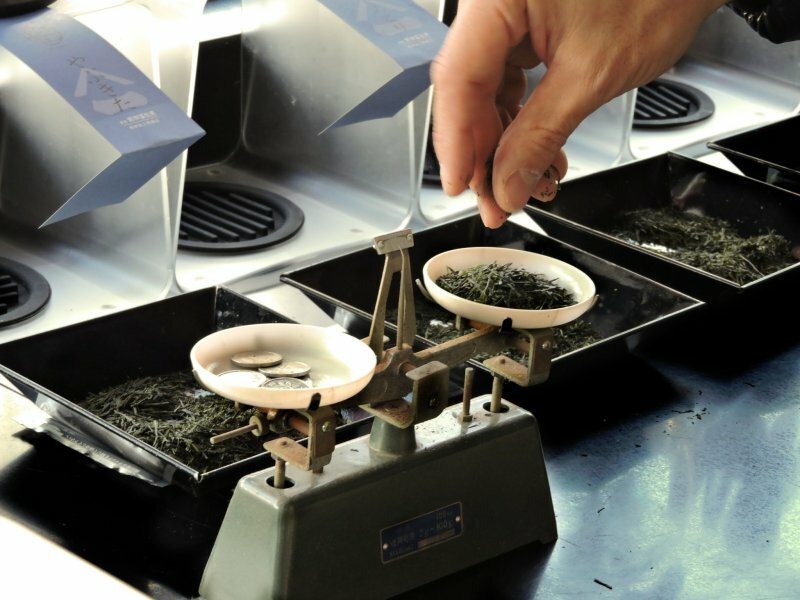 Tea Master Iwasaki began by explaining that we would be working with leaves that had been picked on the same day from the same farm, but had been processed to emphasize the four main characteristics of Japanese green tea: bitterness, umami, sweetness and color. Four small bowls containing tea leaves were lined up on a worktop, and he invited us to smell them. I couldn't detect much difference when they were dry, but as soon as he poured hot water on them, I could notice differences. 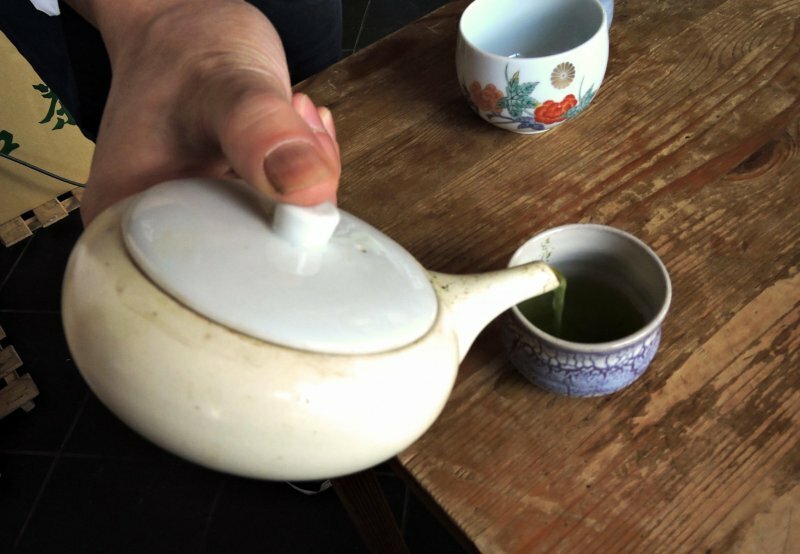 Although Japanese green tea is usually brewed at low temperatures to maximize the flavor and health benefits, tea masters use hot water (90 degrees) because it brings out any weaknesses in the flavor of the tea. 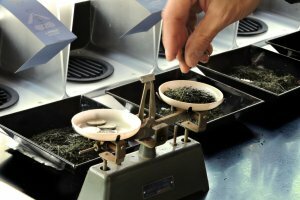 A skilled tea master is similar to a wine taster, in that he can identify the source and condition of the leaves by smell and taste. Next, we tasted all four teas, and for me the differences were marked. Using a small scale and 1 yen coins as weights (1 yen = 1 gram), the Tea Master measured out the different leaves – 2 grams of bitter to 1 gram each of the other teas. Then he placed them in a tin, shook them to combine them, and brewed the blended tea with 60-degree hot water for us to taste. The next step was creating our own blends. I don't much like bitterness in green tea, so I omitted those leaves, then I chose 2 grams of umami flavor to 1 gram each of the other two flavors. We brewed our blends with 60-degree hot water, and I was very happy with my result. Finally, I was presented with my own Mixcha blending kit to take home. It contained samples of the four different teas we used and a mixing tin, all in a beautiful gift box. Maruhide Iwasaki Shoten is open from 09:00 to 17:00. Tea blending experiences can be tailored to suit your preferences, so if you would rather design a roasted tea or a flavored tea, that can be arranged. The store is also a great place to shop for souvenirs! 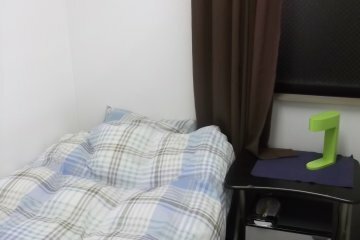 The factory is 10-15 minutes by taxi from Shizuoka Station or 25 minutes on foot. There are many great cafes where you can try tea in Shizuoka Prefecture. 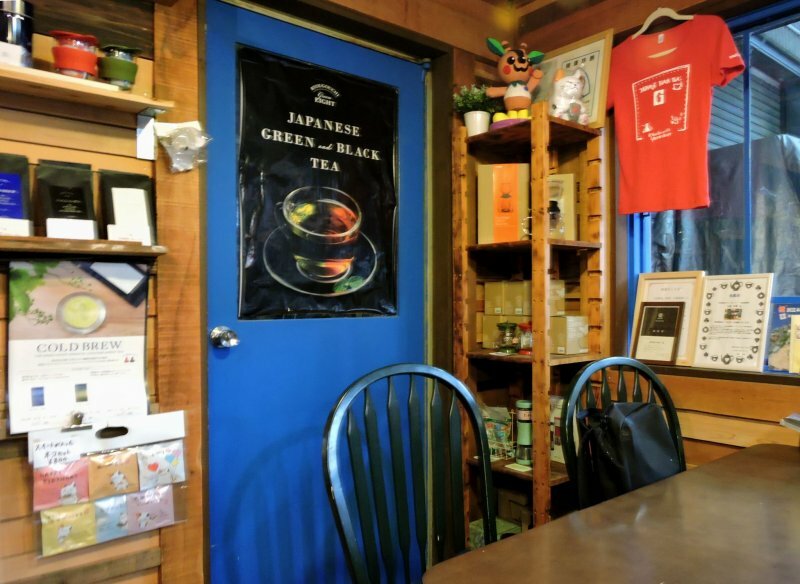 One such popular and interesting cafe is located in Wadashima, a country area about 25 minutes drive from Shimizu Station. 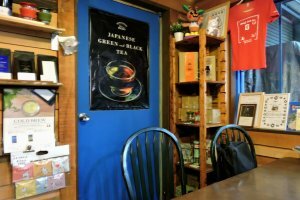 Green 8 Cafe sells a selection of both black teas and green teas (including gyokuro), white leaf tea, steamed tea, deep steamed tea, roasted tea, brown rice tea, hand-picked tea, Japanese tea, and more. 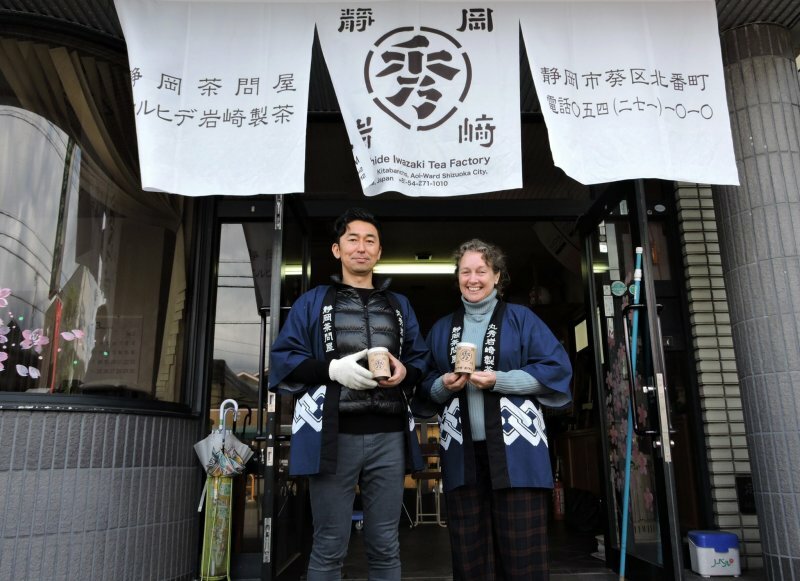 Their business mission is to produce "uncompromising tea" in both Japanese and Western styles; to spread the charms of tea; to provide a healing experience for customers of the cafe, and bring smiles to people's faces through tea. The cafe interior is small, cozy and pleasant, with lots of recycled wood both in the fittings and furniture. 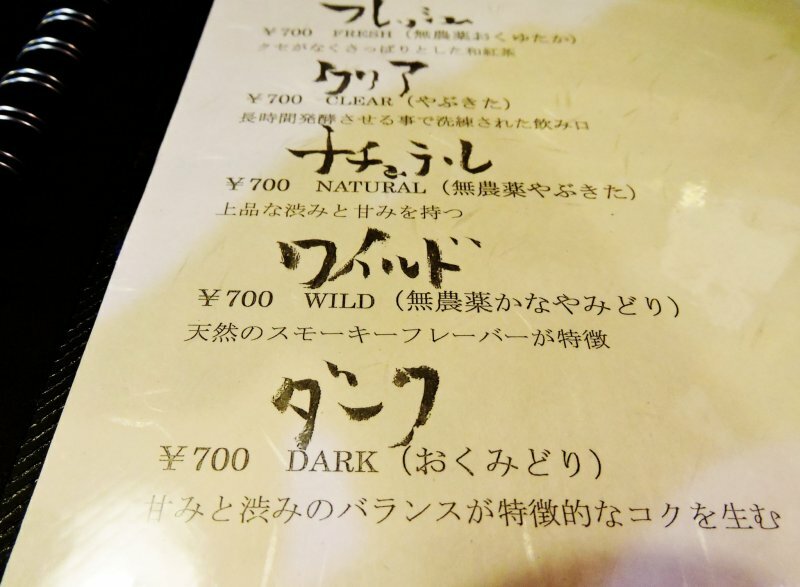 The menu features stylishly written Japanese calligraphy and has a little English, although it is possibly more intriguing than enlightening, with comments like "wild", "natural" and "clear". 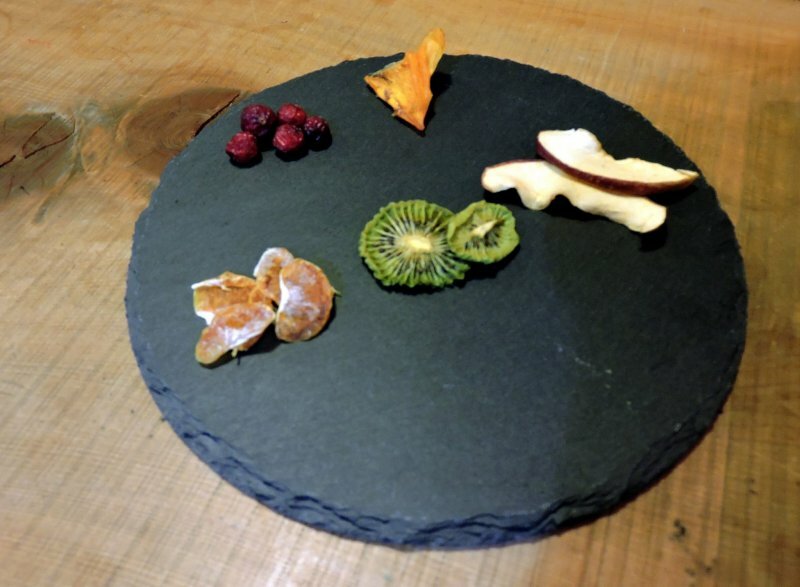 To accompany the tea, there is a choice of Japanese sweet, roasted tea-flavored soft-serve ice-cream, or dried fruit, all of the highest quality. Shelves display packets of tea in cool, minimalist packaging, and also special bottles for brewing and drinking tea on the go – perfect for travelers. 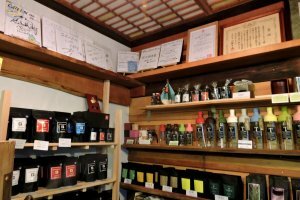 The prices of the teas on sale range from 600 yen to over 10,000 yen for the most expensive, which is surely something really special. 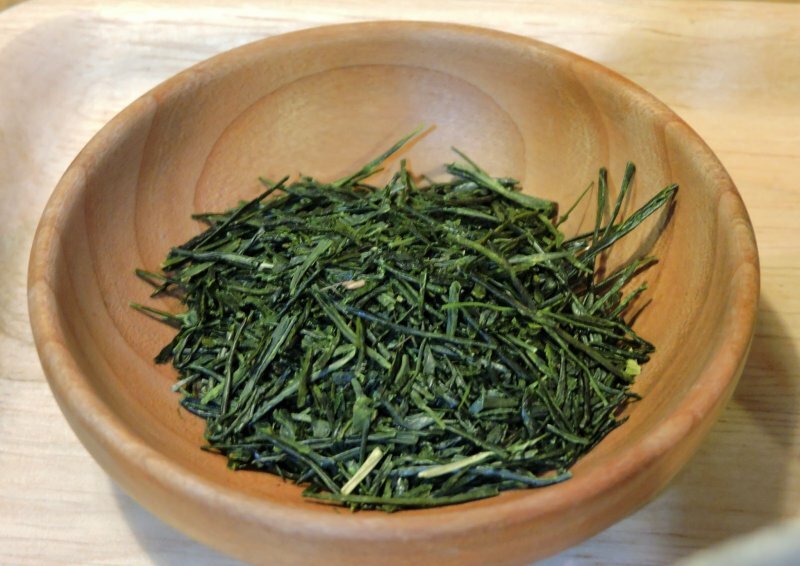 I selected a green tea named Fukamushi, and dried fruit, which would probably have gone better with a black tea. 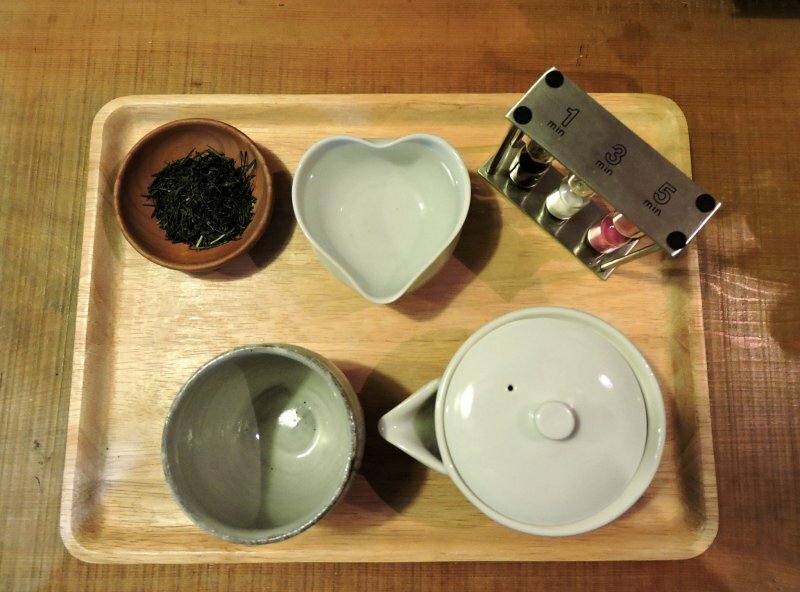 My tea arrived on a tray with the leaves in a bowl and sand timers to help brew them to perfection. 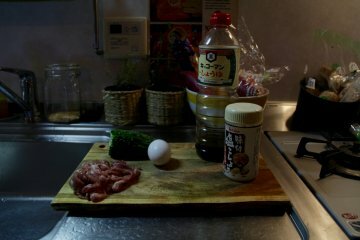 Our host explained the correct procedure, and soon I was sipping a rich umami-flavored green tea. After a second and third brewing, I ate the tea leaves with ponzu (a tangy citrus-flavored soy sauce) and yuzu-kosho (a paste of green chili, salt, and the peel of Japanese citrus fruit, yuzu). Green 8 Cafe is open from 10:00 to 16:00 every day except Monday. 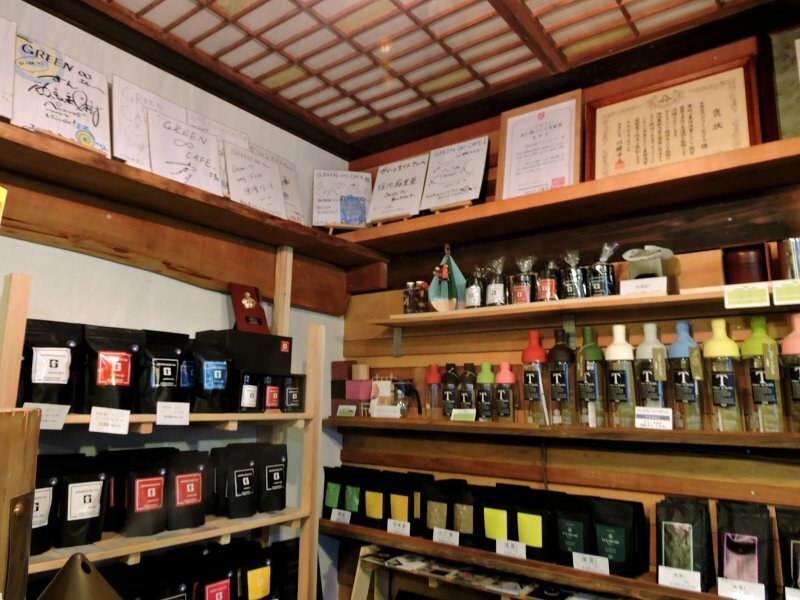 It is an excellent place to try new kinds of tea, learn how to brew them, and shop for souvenirs for yourself or friends and family back home. 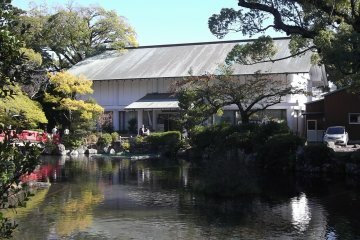 The cafe is about 30 minutes by car from either Shimizu or Okitsu Stations, and about 40 minutes from Shizuoka Station. Green 8 Cafe is a "country cafe" but Cha 10 is definitely a "town cafe". 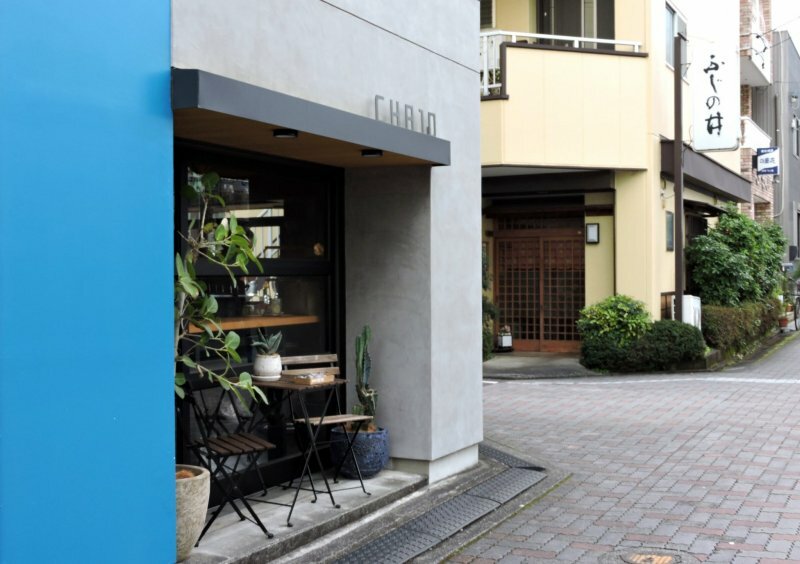 Only a 2-3 minute walk from Shin-Shizuoka Station, this cafe - which opened its doors at the end of 2017 - oozes a modern, trendy vibe. You should pronounce the name "Cha-Toh", cha being tea, and toh being 10 in Japanese. The menu includes a number of enticing prospects. You can order classic matcha, just like you get in tea ceremonies, hot or iced matcha latte, houji chai flavored with 7 different spices, matcha jelly iced latte, matcha afogado with soy milk ice-cream, cashew nuts with a soft, sweet coating, and matcha jar cake with soy milk and gluten-free sponge cake. I went for nitro matcha, the cafe's signature drink. 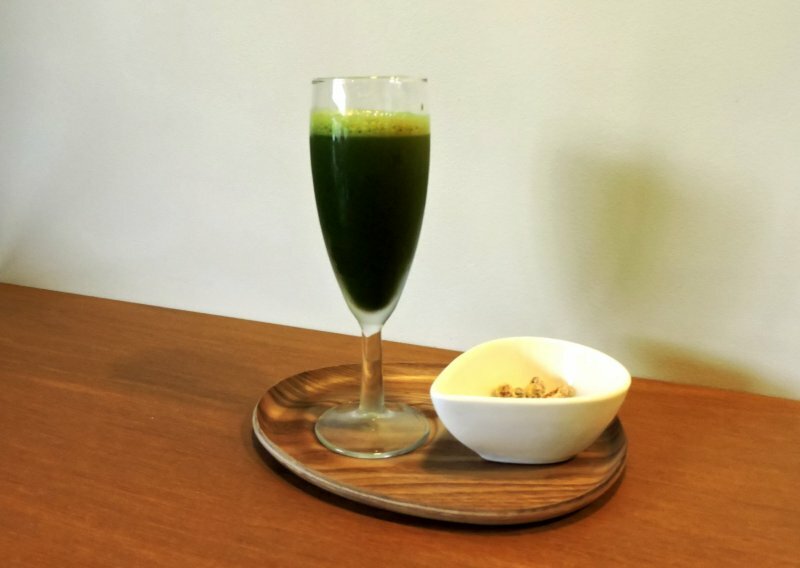 Served in a champagne glass, the sweetened matcha is foamed and chilled by forcing nitrogen through it. I don't usually like sweet drinks much, but the nitro matcha was simply glorious. 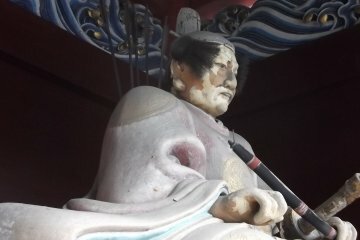 I'm scheming how I can get back to Shizuoka for an encore! Cha 10 is open from 11:00 until 19:00 every day except Wednesday. After 16:00, they also serve alcoholic beverages, including a nitro cocktail which I would very much like to try. You can also buy matcha powder, tea, snacks and even branded hats to take away with you. Nitro matcha, what an awesome name! What an experience to sample and mix freshly picked tea. I mean, you can buy new tea in shops, but picked the same day must taste different. I love the word play, Mixcha! I loved that wordplay too :-) The tea wasn't picked the same day, sorry to tell you. I visited in early March, and tea picking doesn't start until May. I appear to be guilty of ambiguity, and will make an adjustment. Ah! But still fresher then the tea I’ve got tucked in the cupboard.